How deep is the moment? When the wealthy trader Giovanni Arnolfini married Costanza Trenta, he hired the best painter to commemorate their nuptial. After all, this would be their happiest moment, and the value of a portrait conveying that memory throughout the rest of their lives was rightly deemed as priceless. If the couple had married six centuries later, they would have hired a photographer to compile an album of the beautified bride, formal groom, lush bouquet, festive venue, happy friends, hopeful family, sanctified ceremony and drunken celebrations. But since the Arnolfinis’ wedding occurred more than four hundred years before the invention of photography, wedding-commemoration fell on the lap of other mediums. Giovanni Arnolfini commissioned the most skilled artist in the most innovative art-form of his age, Jan van Eyck. Oil was fresh in van Eyck’s day. Its slow fixation allowed the painter time. He could massage his colors to blend and mix layers of different pigments and lend his work a depth coveted by more primitive art forms. So unlike the futuristic medium of photography, that would afford its artist the ability to capture many moments through time, the oil painter would be forced to choose a single moment, and use the strength of his art to mold that moment into unparalleled depths. How deep is the moment? Does it have a rock-bottom? Jan van Eyck resolved to find out. Instead of the pomp of a wedding party in town, he chose the intimacy of a wedded couple at home. The setting is their bedroom. The action is their vow and imminent union. To this, Jan van Eyck applies his art unlike any painter before. He captures the silk-embroidered veil, fur-trimmed gown, fox-furred coat, wooden-beamed floor, brass-gothic lamp, mid-oriental rug, glass-bottle window — to list only a few physical attributes. Over these, he superimposes the emotion of the groom vowing to support his bride through sickness and health, the bride vowing to bear her husband children, and the puppy guaranteeing to infuse family life with lightness. 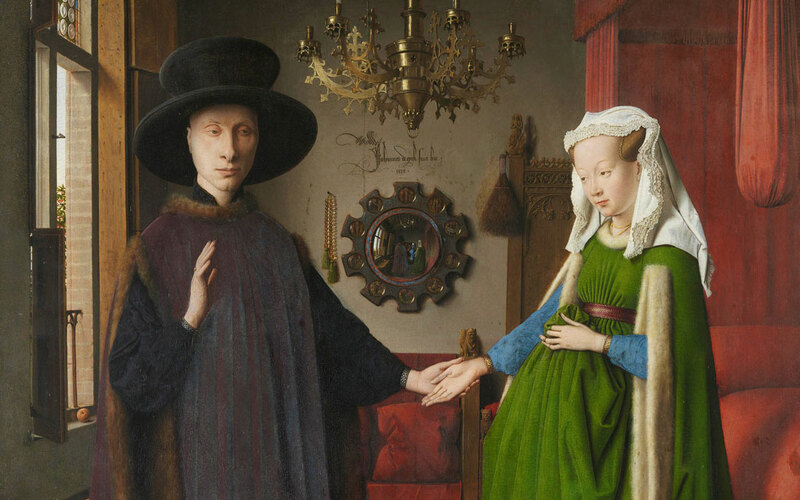 And by setting the couple in their bedroom, with Giovanni’s removed sandals and Costanza’s arm resting on her belly, van Eyck even achieves a progression in time, hinting at imminent union, and in the farther distance, childbirth. Is this the rock-bottom of the Arnolfini moment? How far should van Eyck push his experiment – to the dirt between the beams, rot beneath the apple, and dust above the sill? To answer this question, I must attempt his experiment myself. Although I cannot replicate reality in oil, I can nevertheless observe its each and every detail as van Eyck did. Starting with the luminous screen atop my desk, I move to the book with scribbled notes, pen, mouse, mousepad, keyboard, coffee mug, table lamp, and tissue box – all covered with a thin layer of dust. Then I shift to the muffled sunlight coming through the blinds, how it illuminates the droopy leaves of the thirsty plant, the bookshelf with uneven books, and the cobwebs with spider waiting for opportunity. As I scan the contents of my moment, I am slowly overcome by an eerie sensation. I, too, am part of this scape, with the semi-slouched posture on my chair, the many ideas racing through my mind, the furrowed brow trying to anchor them down, the smile when I succeed and frown when I fail. The eerie self-consciousness deepens as I witness myself observing these many things – screen, book, pen, mouse, pad, mug and lamp. Then it crescendos into an epiphany: I have been the single constant amidst these infinite details. I observed the screen, pad, and pen; the light, leaves and books; the posture, brow and smile. The many have highlighted the one. I am the rock bottom of my moment – the observer, not the observed. Van Eyck must have experienced a similar epiphany. The deeper he massaged his oil into the canvas, the more he saw himself, so much so that the Arnolfini moment – he must have realized – would be incomplete without him. Accordingly, in the farthest depths of his canvas, van Eyck portrayed himself as the omniscient witness of the Arnolfini moment. His experiment ended in transformation: the Arnolfini portrait became a self-portrait.